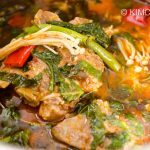 Four Mushroom Rice in Stone Pot or Beoseot Bap is a great one-pot rice dish that highlights the mushroom flavors in a wonderful way. Vegan and Gluten Free. I am back in sunny California!!! 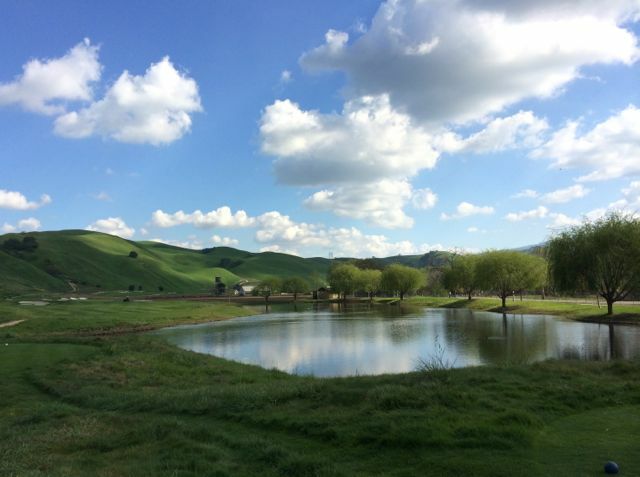 I am happy to report that I am finally fully moved to California. With my kitchen all organized (hmm.. well almost) and the fridge and pantry stocked, I am now ready for some serious food blogging.. :)) Thank you all for your patience during my relocation. I first had this Mushroom Rice (버섯밥 Beoseot Bap) at my sister’s house while I was in Korea and was surprised how good it was. I have never had this lovely mushroom rice before and I wondered why. 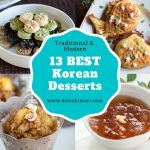 I think it’s because the dish was part of Korean Temple food and people rarely made Temple food at home way back then. 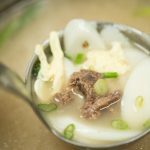 As you may know Korean Temple Food has recently gained large popularity both in and outside of Korea and so many new temple food recipes that were only made and eaten by monks in the past are now becoming part of everyday Korean food. Much like mountain greens (산나물 Sannamul), mushrooms (Beoseot 버섯) can be found in great abundance in Korean cuisine. Korean mountains were full of wonderful mushrooms in the old days but now, sadly they can only be found in deep mountains due to pollution. 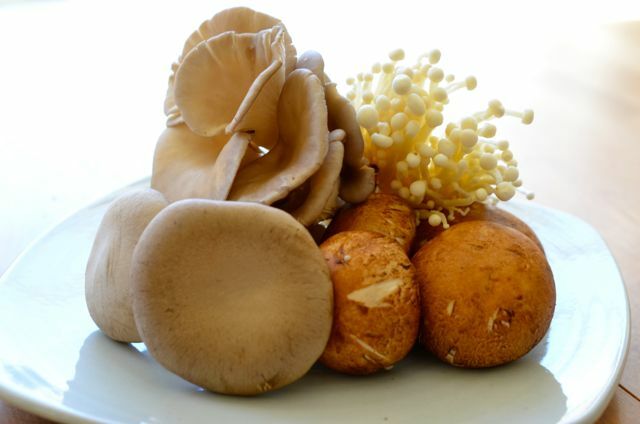 Koreans still love to pick mushrooms from the wild – although every now and then you hear in the news about people getting sick from eating poisonous mushrooms. Yikes!! Anyway, this amazingly comforting and delicious Korean hot stone pot mushroom rice is a must try if you are a mushroom lover. This recipe is adapted from my sister #3’s. Thank you sis for sharing it with me! Wash and soak all 3 kinds of rice in water for 30 min to 1 hr. If using dried mushrooms, soak them in room temp. water for 30 min. DO NOT discard the water!! 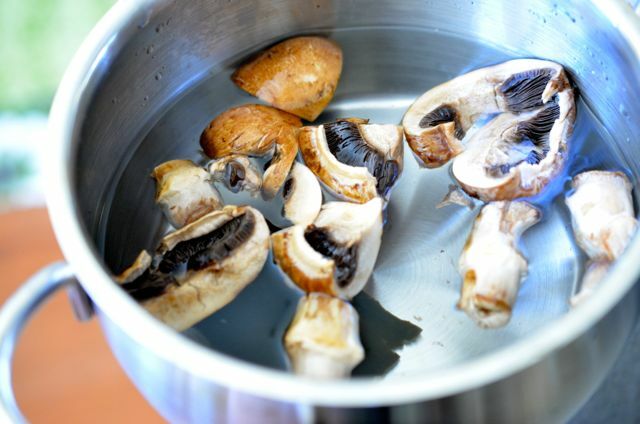 You will be using this mushroom water as stock later. If you are using FRESH mushrooms ONLY, you need to make mushroom stock. If you have dried shitake mushrooms, then you can just use the water from soaking the mushrooms. 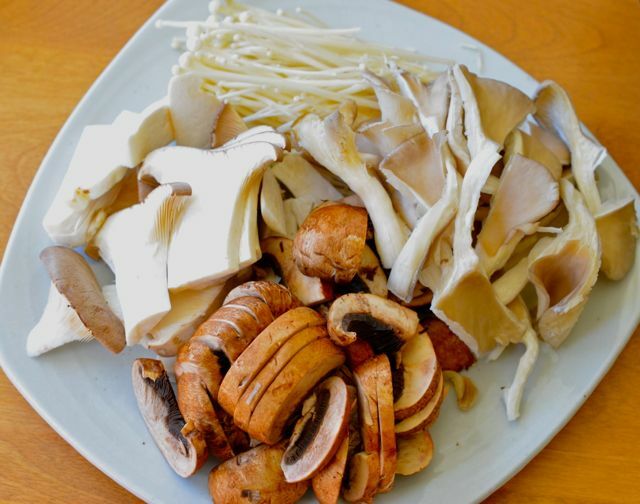 Bring to boil – 3 C water with 1 piece of dried kelp (다시마 dashima), mushroom stems and 2 mushrooms, sliced. Once it boils, simmer for 15 min. Clean and cut mushrooms like below. Because mushrooms shrink when cooked, slice them thick and a bit bigger than bite size. Note – it is best to rip oyster mushrooms by hand because they are so delicate. Drain rice. Get a hot stone pot or cast iron pot or any thick bottom pot that works well for paella or risotto. I used a cast iron rice pot here. Add 1 t perilla seed oil + 1 t vegetable oil to a hot pot on medium high heat. Then add the soaked rice. Stir for 3 min or so until rice starts to become translucent and/or the rice starts to really stick to the bottom :(. Be careful not to burn the rice. Lower heat to medium and add 2 Cups of mushroom stock/water or more until rice is just covered in liquid like below. 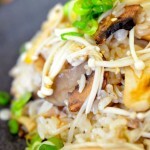 Add cut mushrooms (except Enoki) on top of the rice. Cover and cook on medium heat for 5 min. Lower heat to medium-low and cook covered for 15 min. While the rice is being cooked, make yangnyeomjang. 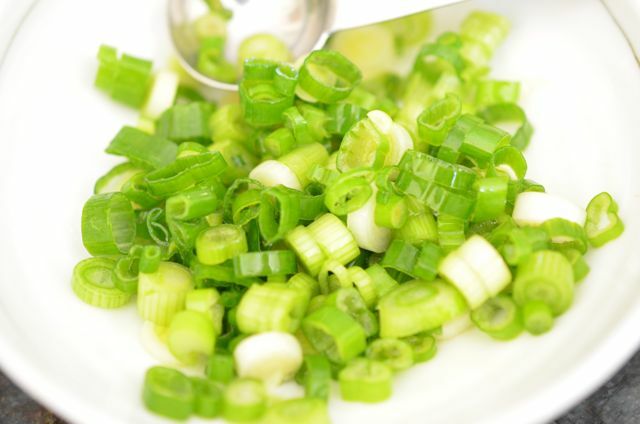 Chop green onions and coat the green onions with 1 tsp perilla seed oil. This way, the green onions stay fresher in the sauce. 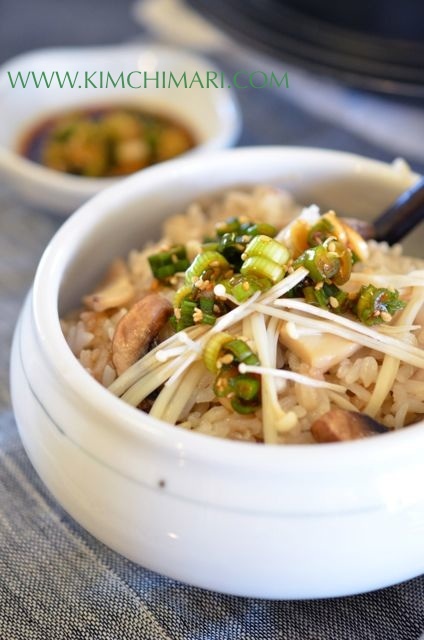 The original recipe uses Korean Wild Chives (달래 Dalae) but since they are only available mostly in Korea in the spring, I used green onions for the recipe. 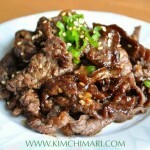 You can also use garlic chives (부추 buchu) and it should be also really good. 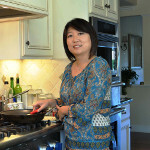 Complete the sauce by mixing 1 T soy sauce, 1 T water, 1 tsp sesame seeds with the green onions. Set aside. Lower heat of the rice pot again to low and cook 10 min more or so until no or very little steam come from the pot. Turn off heat and let it sit covered for 3 min more. 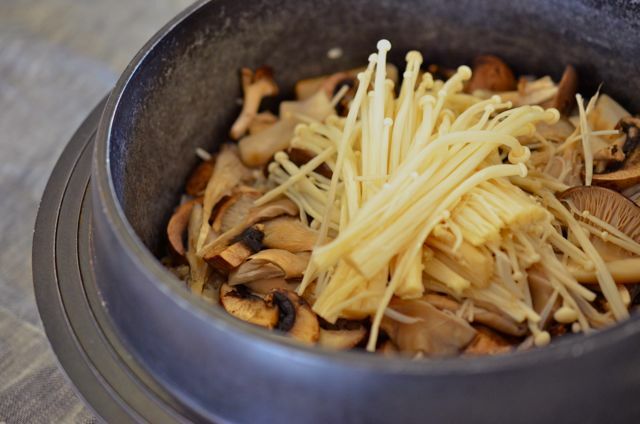 Now add the Enoki Mushrooms on top of the hot Beoseot Bap (Korean Mushroom Rice in Pot). Here is how the yummy Beoseot Bap looks in the pot. It is ready to be served! 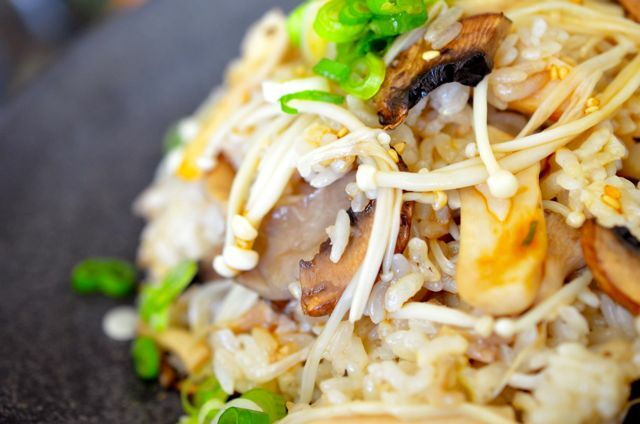 Mix rice with mushrooms and serve in a bowl with sauce on the side. If using dried mushrooms, soak them in room temp. water for 30 min. DO NOT discard the water! You will be using this mushroom water as stock later. 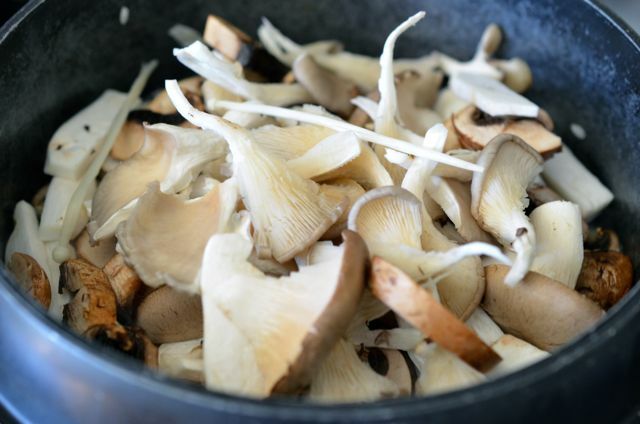 If you are using FRESH mushrooms ONLY, you need to make mushroom stock. If you have dried shitake mushrooms, then you can just use the water from soaking the mushrooms. 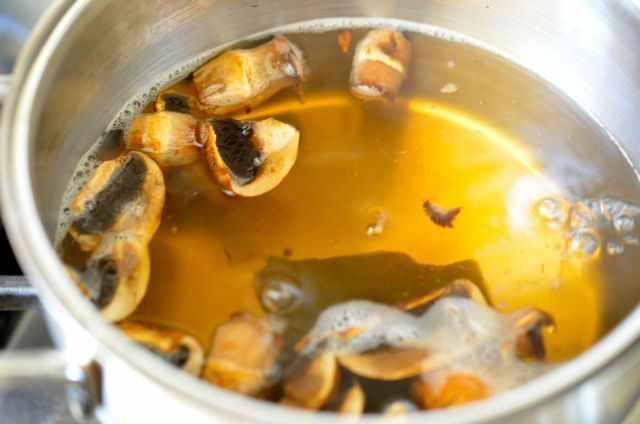 Bring to boil 3 cups of water with 1 piece of dried kelp (dashima), mushroom stems, and 2 mushrooms, sliced. Once it boils, simmer for 15 min. After 15 min, clean and cut the mushrooms. Because mushrooms shrink when cooked, slice them thick and a bit bigger than bite size. It is best to rip oyster mushrooms by hand because they are so delicate. Drain rice. Get a hot stone pot or cast iron pot or any thick bottom pot that works well for paella or risotto. 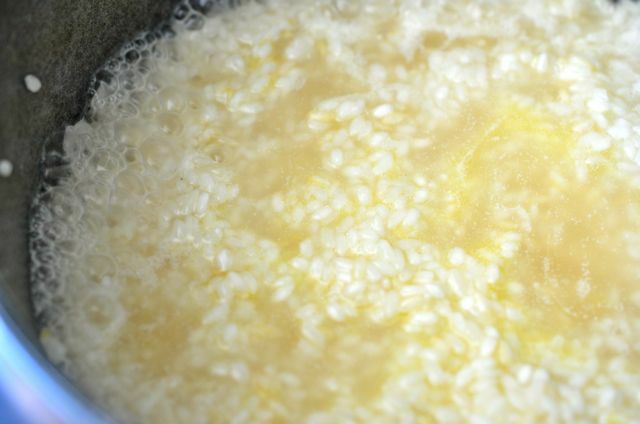 Add 1 tsp perilla seed oil + 1 tsp vegetable oil to a hot pot on medium-high heat. Then add the soaked rice. Stir for 3 min or so until rice starts to become translucent and/or the rice starts to really stick to the bottom. Be careful not to burn the rice. Lower heat to medium and add 2 cups of mushroom stock/water or more until rice is just covered in the liquid. Complete the sauce by mixing 1 Tbs soy sauce, 1 Tbs water, and 1 tsp sesame seeds with the green onions. Set aside. Lower the heat of the rice pot again to low and cook for 10 min more or so until no or very little steam comes from the pot. Now add the enoki Mushrooms on top of the hot Beoseot Bap (Korean Mushroom Rice in Pot). Mix the rice with the mushrooms and serve in a bowl with the sauce on the side. While the rice is cooking, keep smelling the pot to avoid the rice from burning. Adjust fire if you think it’s burning. Try NOT to open the pot while it is cooking. Korean short grain rice are different from long grain rice and don’t do well when you open the pot while it’s cooking. 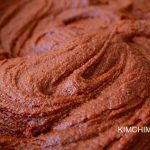 You may think the yangnyeom jang sauce is pretty bland for Korean standards but this is how Korean Temple food is. It really tries to bring out the natural flavors of the ingredients which are mushrooms in this case. So do not make the sauce too strong/spicy because it will overpower the mushroom flavor. You can use regular sesame oil instead of perilla seed oil. It will be less aromatic but perilla seed oil has a flavor that not everyone likes and is also not easy to get in most countries so sesame oil should work fine. You are welcome to use other kinds of mushrooms, but try to use a variety of flavors and textures. An electric rice cooker can make your life much easier but you will probably not get the same wonderful flavor. 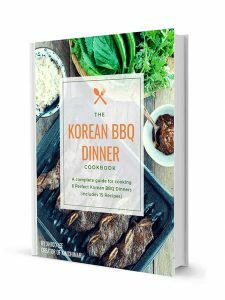 Yangnyeomjang sauce is not included in nutrition facts caculation. Serve with some fresh Lettuce Salad (상추 겉절이 Sangchoo Geotjeori) and Soy Maple Glazed Anchovies (멸치볶음 Myeolchi Bokkeum). 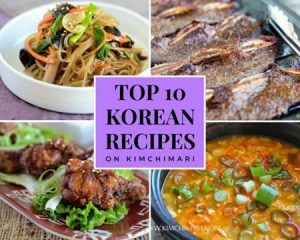 Also pairs well with less spicy, fresh tasting Kimchi like Green Cabbage Kimchi. 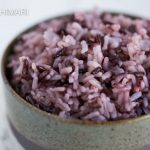 Hi, what is sweet rice? I live in Singapore where I can probably buy it buy never heard of it. Could you please give some examples? 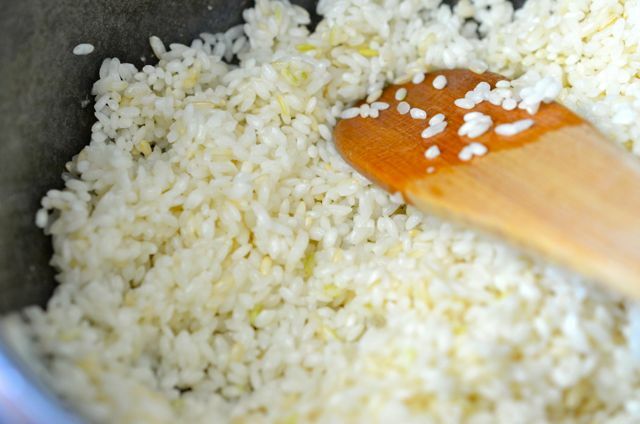 Hi – it’s also called sticky rice or glutinous rice. Does that help? That looks stunning and I may attempt it this week for Christmas!!! Much appreciated and I cherished hearing the narrative of you and your hubby!!! Happy Christmas! Happy Christmas to you too! Glad you enjoyed the story. Would really love to hear why you rated 4 instead of 5? Just wanting to know the reason so I can try to improve going forward. Thank you for your feedback. 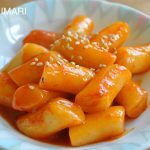 Where can I find Korean wild chives in Califirnia? I dont remember ever eating it in the states. All our local Korean grocery stores sell Korean wild chives in the early spring. It is quite seasonal so not sure if they are still sold at markets. 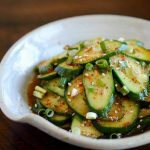 If you cannot get wild chives, you can certainly use regular Korean chives instead. Thanks for asking. Enjoy! You can also use more brown rice and the calories will be even lower. Sure, if you want, you can certainly add some seasoned ground beef but you may lose some of the delicate mushroom flavor. Thanks for commenting!